St. Petersburg is comprised of lots of people who care for their fellow neighbors, especially those who are over-challenged in some ways. This article highlights numerous efforts to try to ‘green’ areas that have been described as food deserts. This article will describe, in somewhat chronological order, large, small, short, and long projects that are helping to teach people how to grow healthy, nutritious foods. The article will also spotlight some of St. Petersburg neighbors who are making these good things happen. Kip was raised on a sustainable, organic farm in southeast Massachusetts. He hated it! He chose a path of academia and followed his desire to study and teach history. 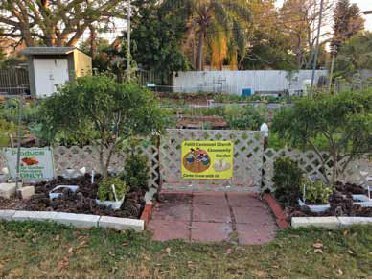 In January 2009, as a professor, Kip worked with local students to design and build an edible school garden at Lakewood Elementary on St. Petersburg’s south side. The 13-bed garden was built by fifth-grade students. The students suggested the idea of a Harvest Festival when the time was right. They invited their parents. Over 200 people attended this event of celebration. 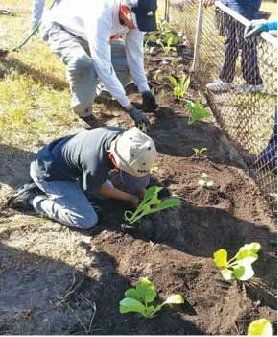 Since then, Kip has worked with college students and Pinellas County school teachers to develop effective academic support of elementary life sciences through planting and harvesting of vegetables. Kip now works on a project called the Edible Peace Patch Project. The goal of the project is to create sustainable food systems to address the impact of poverty in south St. Petersburg. The second schoolyard garden, Sanderlin IB World School, was started in January 2012. Maximo Elementary school became the third garden in January 2013. The fourth schoolyard garden, Campbell Park Elementary was also started in 2013. Four additional school gardens are expected by January 2014. The Edible Peace Patch Project has been a non-profit organization since May 26, 2011. The three-pronged design features schoolyard gardens, urban farm program, and food and wellness program. For information, visit peacepatch.org. Contact Kip Curtis at kip@peacepatch.org. Or call him at 727-320-6822. Emmanuel has an extensive knowledge of agriculture, food production, distribution, and cooking. He might not tell you of his experience as a chef and a restaurant owner. Here in St. Petersburg, we are pleased he established the Faith Garden at the Faith House transitional facility. Emmanuel established the first licensed community garden on October 10, 2010. That date was considered to be a Global Work Party for organizations and charities who were encouraged by the 350.org to do something that would help deal with global warming within their community. Emmanuel developed a method for creating planting beds in a unique way. The process involves digging a two- to three-foot-deep trench that is three feet wide. An impermeable layer is placed at the bottom. Next, alternate types of materials are layered. The process helps recycle organic material… thus eliminating the costly county expense of shipping tons of these materials to another county. 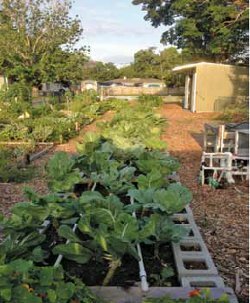 Faith Garden organically grows fruits and vegetables for the 40 residents who live at the facility. 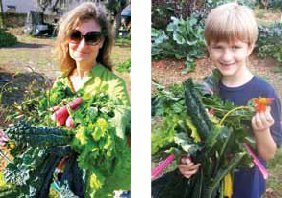 Excess produce is sold through St. Pete Locally Grown organization. The Faith Garden is a demonstration site for permaculture and gardening classes. It is also a healing garden and peaceful community spot. Emmanuel is also a board member of St. Petersburg Sustainable Urban Agriculture Coalition (SUAC), as well as a board member of the Edible Peace Patch Project. If you get to meet Emmanuel, you will probably notice his extraordinary enthusiasm for all his endeavors. For information, contact Emmanuel at 727-251-1879. Candace is a teacher at the SunFlower Elementary School on 27th Avenue South in Gulfport. As part of a history unit, Candace decided to establish a colonial garden with her students. She wondered why the garden was not an immediate success. A nearby neighbor, Emmanuel Roux, explained that the garden was not getting enough water. Candace sent an appeal for help to the parents of her students. On a Saturday in January 2013, twenty parents showed up with the necessary equipment to dig a three-foot-deep trench. Emmanual brought young plants he obtained through a gardening grant. The plants included collards, radishes, carrots, and Swiss chard. The fourth- and fifth-grade students enjoyed working in the garden at the school. They loved cooking and eating the vegetables they helped to grow. SUAC Board member, Ray Wonderlich, III, and six-year old volunteer, Jonathan Miller, participating in a 10,000 Greens planting day. Candace and her students have appreciated all the assistance they received from Emmanuel and the parents of her students. Next season’s garden might also include sweet potatoes. Candace is enjoying this new outdoor classroom experience with her students. The Sustainable Urban Agriculture Coalition (SUAC) was established in 2011, with a grant from Bon Secours Healthy Initiative. SUAC’s goal is to help community residents be able to obtain fresh, locally grown produce by expanding edible gardens and urban farming. For additional information on SUAC, visit www.stpeteurbanag.org. Winnie Foster, SUAC boardmember, said, “When we started SUAC, we received encouragement and help from St. Petersburg Chamber of Commerce president and CEO, Chris Steinocher. The Chamber also helped by recommending we apply for financial support from Bon Secours Healthy Initiative. The Chamber also provides a location for our meetings. Diane Friel, SUAC boardmember, serves as chairperson of SUAC Community and School Garden committee. Diane said, “There are presently four community gardens that have permits, eight church gardens (who do not require permits), and 12-14 school gardens. School gardens require the support of the school principal, two staff members, and one parent. SUAC tries to help the schools to find and apply for grant money. I also serve on the Ordinance sub-committee. 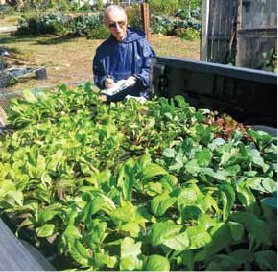 In that capacity, we are assisting to revise St. Petersburg’s agriculture ordinance to enable community gardens to be allowed to sell their produce. We hope the new agricultural ordinance will pass by the end of the Fall and become effective in January 2014. Annette Hubbard is a member of the Faith Covenant Church (FCC), Garden Club of St. Petersburg, and SUAC. She helps to maintain an up-to-date list of community gardens in Pinellas County (www.gardenclubstpetersburg.org). Annette said, “We need your help to ‘green’ St. Petersburg’s food deserts. We are using the Kick Starter Hydro 2 Table to get hydroponic gardening opportunities around St. Petersburg. For every $500 raised through Kick Starter, we install a hydroponic growing system at a community garden. FCC has so far donated over six hundred pounds of produce we grew, harvested, and delivered in 2013.” Visit these websites for information: www.Hydro2table.com, facebook.com/Hydro2table, and QR code Kck.st/15HDJ69. Bill Bilodeau is a SUAC boardmember. His expertise, training, and multiple certifications in permaculture have prepared him to be a welcome source of skills with community members. Bill generously shares his skills to gently encourage others to try their hand at gardening. As a lifelong student, Bill took a ten-day trip to Cuba to study organic and urban agriculture. Bill said, “Cuba is way ahead of the United States in these areas.” Watch for a special future article in this publication devoted to Bill’s exciting trip to Cuba. The work being performed by so many St. Petersburg residents is something we can all be very proud of. Many people are challenging themselves to learn new skills relating to urban agriculture. Others, are challenging themselves to teach these skills to all ages of people. Perhaps the next person to join in these urban agriculture efforts will be… YOU! Mary Hampton is a retired educator who moved to Florida in 2007. Since arriving in Florida, she has been doing non-stop research regarding the topics of recycling and sustainability. She has been on a quest to meet people who are also interested and involved in these topics. Her present interest involves researching and writing about these topics. If you would like to collaborate with Mary on a project, contact her at queenofrecycle@hotmail.com. Even from afar you focus on our community. Great piece.